1) maybe one of the worst matches i've seen us play in the CL. we looked like we had no idea what we were doing. 2) gattuso should never ever ever ever be selected for our captain again. 3) i think boateng and/or pirlo would've been good to have in this game. You needn't have bothered responding to it, Ash, but you did a good job in practically rubbishing his entire post. Had his post had any relevance at all, then fine, but he just comes accross as your stereotypical xenophobic sweaty with an inferiority complex. Anyone that thinks Qatar would have done a better job than the US is mad. The negatives for the US are the size and te fact they've had it before. Both of these are somewhat redundant though as multiple countries have had the WC twice, so why not the US? The size factor is reduced as in the 1994 World Cup they regionalised the grops so the distance needed to travel wasn't much. Can anybody give me any good reasons why Qatar should have beaten out the US? The fact they've never had it before means nothing, hundreds of other countres haven't. It's a joke. Oh well, I'm busy summer 2022 anyway. There are 0 reasons. And the travel thing is bogus...if our infrastructure worked in 1994, it would easily still work now with a much improved system. From all the candidates that were up for 2022 you can not tell me that it would've been more successful anywhere other than the US. Personally, I don't think any country could put together a more successful World Cup than the US. 1994 still having the largest attendance ever is proof enough (with a smaller group of countries participating). The difference between a US World Cup and a Qatar World Cup is mind blowing. It's not even close. FIFA are idiots, plain and simple. There is no question that up until this morning the US and England were by far the front runners. It wasn't even close. Something happened to change that. And that's why I've lost faith in the entire system. They're doing everything in their power to kill one of the great competitions in the world. england (as stupid as it is) at least lost a country that could possibly do a good job of hosting the world cup. we lost to Qatar....Qa freaking tar. they had a chance of creating a fan base that would dwarf all other fan bases around the world. but they chose not to. chose to take the money and run instead. the little faith i had in FIFA has been kicked square in the nuts. I've officially lost all faith in FIFA. Hope whoever got paid enjoys their new found wealth. Great win - good to finally see a team that shows grit and determination in these kind of situations. Still should have been sent off as well though. Milan superstar Zlatan Ibrahimovic has offered a Swedish teenager a dream opportunity with the Serie A giants after discovering him in his very own back garden. Malmo teenager Erik Kristjansson got the shock of his life when Ibrahimovic told him to pack his bags and head for Italy for a trial with the Rossoneri after the two enjoyed a kickabout at his home in Sweden. The Swedish striker is friends with Kristjansson's architect father Gisli who helped renovate Ibrahimovic's mansion in his native Malmo. Luckily for the teenager he accompanied his dad to the house last weekend and snapped up the chance to have a kickabout with its owner Ibra who was home for a visit. Ibrahimovic was impressed with the 16-year old's skills and was immediately on the phone to Milan. "Zlatan came out and said, ‘How would you like to try playing for Milan?’," Gisli Kristjansson told Swedish news site The Local. "We said, are you joking, and he said it was no joke. We couldn’t believe it," added the delighted dad. The very next morning the teenager boarded a plane destined for Italy and has spent the week training with the other talented youngsters in the famous Milan youth academy. "It's like a fairy tale. I’m a bit nervous, but football is Erik's life and as a father, how could I say no to an opportunity like this," Mr Kristjansson said. His son Erik has been busy in his first week settling into his dormitory and taking part in training. "Our training sessions are like the games at a very high tempo. I'm learning an incredible amount. Wherever it leads to we'll see. I hope I get to stay," Erik Kristjansson told Swedish newspaper Sydsvenskan. "I see myself as a winger but I've also played in other positions. It's a lot of running but I've got good lungs!" Ambitious Erik is hoping to emulate Malmo's most famous son by making his name in Italy. For now the teenager doesn't even have a return ticket home. "I don’t know when I’m coming home. Hopefully never," the teenager told Sydsvenskan. "My life is football and this is the chance of a lifetime. I didn't believe it was true when Zlatan told me I could come here. Even if this doesn't turn into anything I'll still gain a lot of experience and other clubs might become interested. My goal is to see how far I can go in football." Milan vice president Adriano Galliani has demanded his team win Serie A or they will be compared to an "amusements park"
The Rossoneri spent heavily on attacking players this summer, bringing Zlatan Ibrahimovic and Robinho to the club, but have been inconsistent at the start of the season. Still, they are only two points behind leaders Internazionale and Galliani feels they have a great chance. "Milan must win the League," he said. "We are not an amusements park. "Milan are growing and fortunately the gap at the top is smaller - 10 points in five games (from leaders Inter) means that there is great balance. "In this balance, we are trying to recover some other positions in the table. In any case, there is balance." Don't forget to include the source. sorry, Fox Soccer use to get all of their stories from AP and would include it in their stories. Apparently they've started using a different newswire. 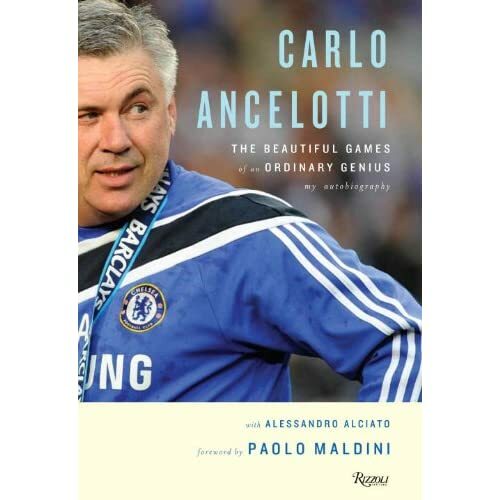 why is a book written about a milan/italian legend have a picture of him wearing a chelsea shirt on the front cover? I understand that's where he is now, but seriously...just ridiculous. ilippo Inzaghi is delighted Zlatan Ibrahimovic joined AC Milan, and claims the Rossoneri are now "on the same level as Inter Milan". The Swedish striker joined Inzaghi's team on loan from Barcelona last month, but will also be under contract with the Italian side for the following four years. His arrival, coupled with Robinho's signing, has reinforced Milan's already powerful attacking line. "I have been struck by Ibrahimovic's enthusiasm," said Inzaghi. "He has come to the right team to win the Champions League. "Now we are on the same level as Inter Milan. "There is a lot of enthusiasm on and off the pitch." Inzaghi has won two Champions League trophies with AC Milan, the last in the 2006-07 campaign. The 37-year-old is hoping to beat Gerd Muller's record of scoring in European competitions, having equalled it last season against Marseille. "My dream is to beat Muller's record in the Champions League, scoring against Auxerre," he said. posted on Fox Soccer, but they get a lot of their news from a group called RivalsDM, which is basically just an online news-wire for sports. i'm guessing the B-List are players they can pull from if they want to. say one of the 4 strikers needs to rest, pato can replace them. i take this as saying that pato will probably play more serie a games. could be completely wrong though. Zlatan Ibrahimovic has hailed AC Milan's transfer deadline day signing of Brazil winger Robinho from Manchester City. Ibrahimovic, speaking at a news conference on Wednesday ahead of Sweden's 2012 European Championship qualifying match against Hungary, described Robinho as a "magician" on the field. The striker, who moved to Milan from Barcelona last week after only one season, criticized the Spanish club's coach Pep Guardiola, who he said had yet to give him a reason for freezing him out of the team. Ibrahimovic said he places the blame for his exit squarely on Guardiola, saying that "the bad picture shouldn't be on the club and the players - the bad picture should be on the philosopher." on what bases should he be simply let go? I don't think the squad's complete, acid. Sorry. We still don't really have a competent RB.